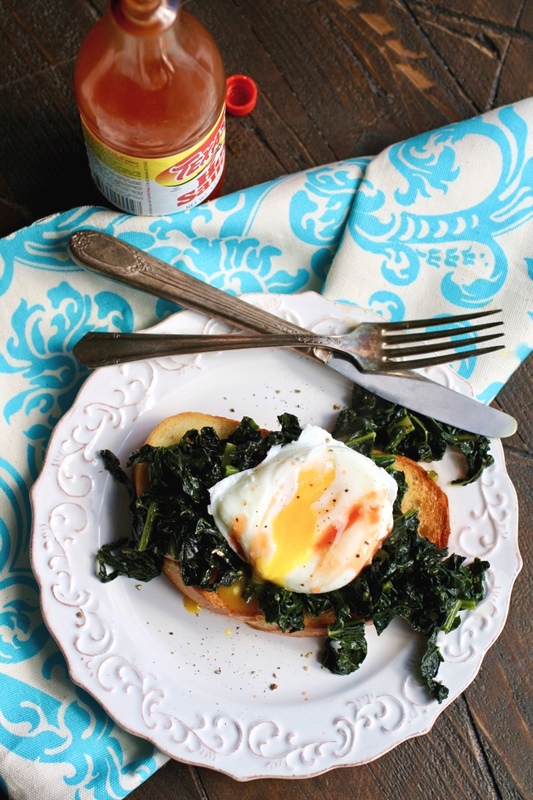 Sautéed Kale on Toast with Poached Eggs is one of my favorite breakfast dishes. It offers a lot of flexibility and a ton of flavor. Heck, this is even a great option for dinner! Goooooooood morning! If I sound perky this a.m., it means that I’ve had my first cup of coffee. I’ve said it before and I’ll say it again: I can barely function in the morning without first having a cup of coffee, and that struggle is very real. Anybody with me? Come on. I know you’re out there! 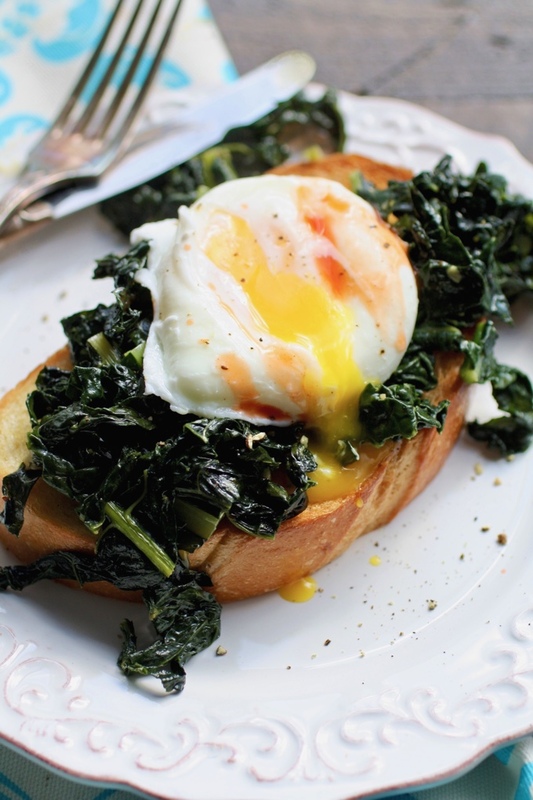 Elaborate breakfasts have their place and time, but when you don’t want a lot of fuss, I hope you’ll remember this simple breakfast recipe for sautéed kale on toast with poached eggs. If you want a tasty AND pretty breakfast (also easy to make), you’ve gotta try my Blueberry Dutch Baby Pancake. It’s perfect on the weekend or for a special brunch. More into prepping breakfast the night before so you can just pop it out of the fridge in the a.m.? Then try my Cherry, Almond & Coconut Overnight Oats with Chia recipe. Planning ahead has its benefits! 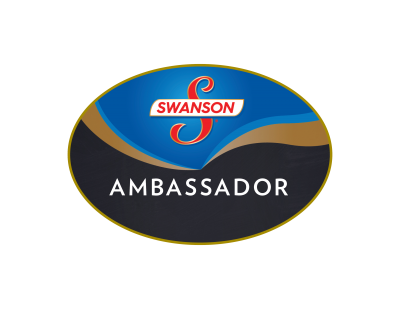 For a little extra “oats insight,” check out the tips here to perfect your overnight oats, along with a bunch of recipe options. Okay, sorry! 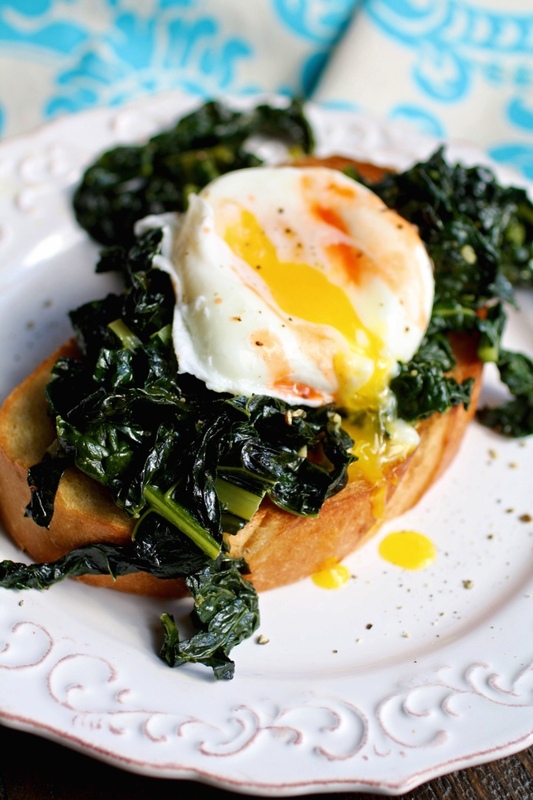 I need to focus on this sautéed kale on toast with poached eggs recipe (more coffee, please!). 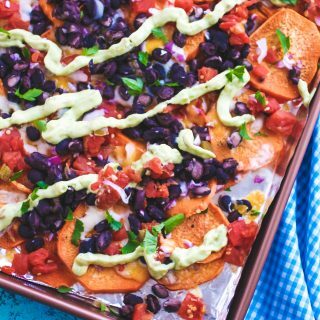 It’s one of those filling and oh-so-good recipes that won’t bog you down at the beginning of the day. You might even be able to use last night’s leftover kale to make breakfast even quicker (I lovvve adding veggies to eggs). If that’s the case, then you’re just really making toast and eggs here! One of the age-old egg arguments (egguments?) is whether you like your eggs runny, or not runny. Me, I go both ways: sometimes a runny yolk turns me straight to cereal and milk, and other times I’m craving it like nobody’s business. Clearly, poached eggs will attract fans of runny eggs, but who’s to say you can’t make your eggs over hard, or scrambled for that matter? Do what you like! For right now, I’m in the runny camp, and this recipe walks you through how to EASILY make poached eggs. Whether you try sautéed kale on toast with poached eggs for breakfast, or maybe even for lunch, I hope you’ll give this simple dish a try. You’ll love it as-is, and you’ll also love that you can personalize it to your tastes. You'll love how easy it is to make this breakfast dish! It's also quite easy to personalize it to your tastes! Add the oil to a large skillet over medium heat. When hot, add the garlic and cook for 30 seconds. Add the kale, season with a bit of salt and ground black pepper, stir to combine, and cook for several minutes. The kale should begin to soften. Add the broth to the skillet and increase the heat slightly. Stir, and allow the broth to cook down until the kale softens to your liking. Most of the broth should be absorbed. To poach the eggs, bring a large skillet of water, filled 3/4 to the top, to boil. Add the vinegar to the water and reduce the heat to a low simmer. Crack the eggs into separate cups and carefully tip them (as close to the water as possible) from the cups into the water, keeping them as separated from each other as possible. Cook the eggs for about 4 minutes, until the whites have set. Remove with a slotted spoon and gently pat the whites dry. Mound several forkfuls of kale over each piece of toast and top with a poached egg. Season with salt, black pepper, and a dash or two of hot sauce. Yum! That looks amazing!! I love a good poached egg!! AND I love the plate you have!!! So pretty!! Ooo! That sounds like a great idea, Candy! Thanks! I love everything about this! Seriously, this would be the perfect breakfast. Thanks, Lindsay! 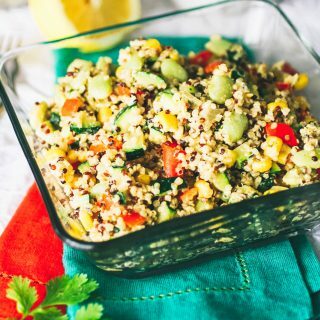 It's so simple, AND delish! I'm not an egg person but I think my husband would LOVE this! It looks amazing! Thanks, Jamie! Maybe you're husband will give it a try and like it! Ooo! Now that sounds like a winner! How can you go wrong with cheese?! Thanks, Sarah! Waking up wouldn't be so hard if I knew I had this to wake up to! I'm not that awake until I have coffee:) Great way to use leftover kale from the night before...I just love poached eggs!!!! 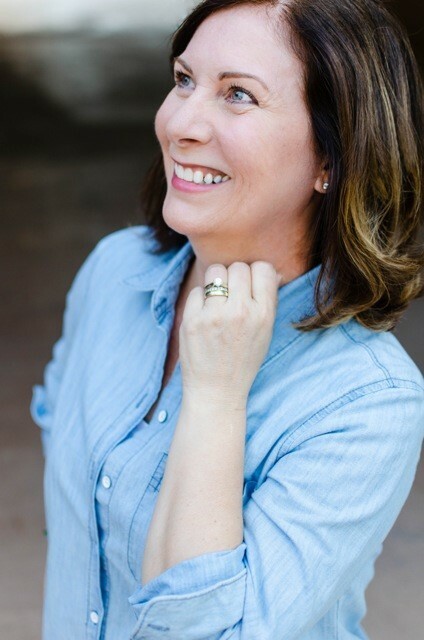 Thanks, Lora! I'm the same! I never had kale. Apparently is kind of difficult to find it around here, dunno why. Maybe I don't search enough. ANyway poached eggs are so nice, I love making them! Hi Cristina! I think any type of greens would work with this, too! Sometimes I even use roasted asparagus! Hope you try it sometime. Thank you! Ohhh, I live for that first cup of coffee! I need it, ha! I also need this breakfast! I love the sauteed kale! Oh my goodness ... I hear ya on the coffee thing. I'm blissfully sipping away right this moment (and totally craving some kale poached eggs!). Easy breakfasts are an absolute must on busy mornings, and I love the idea of using last night's leftover kale (or ... hey, hey! ... just cooking some up a day or two ahead to have on hand for this! ), so breakfast is even easier! I'd totally do that! And no egguments (lol) from me - I adore eggs of any kind, but I'm always, always up for a good "dippy" egg - this is absolutely my kind of healthy, savory, awesome breakfast recipe! LOVE IT! Thanks a bunch, Shelley! I can never imagine a day without coffee ;) And great suggestion for prep-ahead with the kale - I need to do more of that! 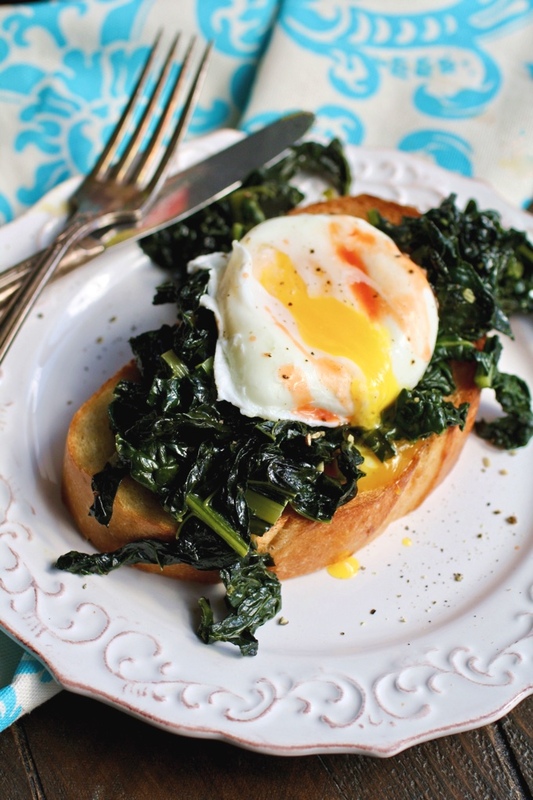 we've been talking around our table about new breakfast ideas...love the sauteed kale, yum! You can't go wrong with sauteed kale (and lots of garlic)! Thanks, David! I eat eggs on toast every day and this looks amazing!!! I need to start adding some kale in the mix. Yes! It makes it even more delicious :) Thanks, Lauren! Drool! This looks so good to me! I love kale, I've never had kale toast though. I need to try this tomorrow morning. Oh! I hope you try it soon! Thanks, Krsyten! Thanks, Michelle! Hope you love this one! That's too bad, Bobbi! BUT, yes! There are sooo many tasty options! This looks delicious! 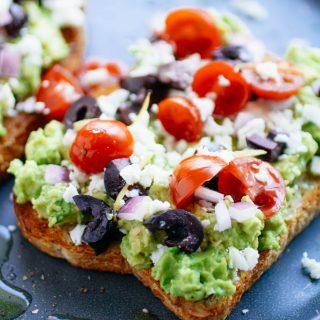 A fresh, healthy spin on a classic breakfast staple. I'm stopping at the grocery store for some kale, and trying this for breakfast tomorrow. Thanks, Cait! Hope you love this one - so filling! I have a bunch of fresh eggs and kale from my garden to cook with. This seems like the perfect recipe, I bet it's absolutely delicious! Thank you for the inspiration, I can't wait to give it a try. Thanks, Angie! Hope you love it! Thanks, Nicole! I hope you do, and enjoy! Now I'm hungry all over again! Thanks for stopping by, Nicole, and for the kind words! I'm all about a perfectly runny yolk and this recipe is exactly how I want to start my day! Mmmm, for sure! Thanks so much, Dara! This looks so good and healthy! I am going to keep this in mind for a quick dinner, as well as breakfast. Excellent idea! I love it!